Unless you’ve been living under a rock (cue Geico) you’ve probably heard the infectious single by Foster the People called “Pumped Up Kicks” on the radio this past year. What you may or may not have noticed, though, is that that sunny 60’s-soul-soaked song is really about an alienated, psychotic teen fantasizing about (or even considering) shooting and killing his classmates at school. I’ve been wanting to tackle this song for a while now – but it was only after watching Terrence Malick’s first film Badlands last week that something clicked. I quickly made the above video, confident that the song and the film can illuminate and explain each other. Foster makes some important points – while the tragedies of Columbine and Virginia Tech probably stand out as two of the most tragic, there has been an alarming increase in shooting incidents at schools in recent years. It’s important that artists tackle the issue by drawing our attention to the hearts and souls of those alienated, bullied, and lost youth who feel like violence is their only option. Admittedly, though, this subject has been tackled quite a bit, especially in music. Pre-Columbine, Pearl Jam was tapping into the psychology of just such a young person with the song and video “Jeremy”; post-Columbine, goth-rock group Korn’s single “Thoughtless” is about “a bullied teenager who dreams of killing his tormentors,” and POD’s “Youth of the Nation” describes a school shooting in the first verse. But all of these songs predictably reflect their subject matter – the music itself is dark, violent, and disorienting. It’s what we’d expect an alienated, angry youth’s thoughts to “sound’ like, and allows us to distance ourselves from them, even though we remain empathetic. The lyrics are particularly horrifying because of their context – the song is not insanely angry nor insanely happy. There’s not anything there to signify the insane or even dangerous – its exterior is casual, smooth, and easy-going. This was also my experience of the song – and after watching Badlands for the first time, I realized that it would have been a good fit for the original soundtrack. First, there is a literal connection: Malick’s first film is also about a cigarette-smoking wanna-be cowboy (“Kit”) who decides one day, with an air of aloof indifference, to start killing. Kit lures his young girlfriend Holly into his senseless crime spree, which plays out against a very Midwestern background that reflects Kit’s attitude (one reviewer called the scenery “breathtaking both in its sweep and in its banality”). But even though they’re deluded and dangerous, they still come across as somewhat sweet, simple, and even bored with themselves and their actions – and the effect is terrifying. As one reviewer wrote: “Sheen conveys Kit’s craziness so effectively because he does not ever act the madman.” They shrug, smoke, and mutter across the plains – all the while feeling, as Holly puts it, “kind of blah, like a bathtub after the water has all gone down the drain.” They are – like the singer in “Pumped Up Kicks” – all too casual. This notion reflects a Thomistic idea of evil, with its roots in St. Augustine: evil is not a “thing” or a “being,” but a privatio boni, or “lack of good.” Good can exist without evil – but evil can’t exist without good. Evil is a parasite of the good, with no real essence. Of course, none of this means that we identify or even empathize with the violence of either the song or the movie – no more than Arendt identified with Eichmann. But maybe it means that we are forced to confront their humanity, and in doing so, better understand our own casual inclinations toward evil, and evil itself. This is not a comfortable process – it’s also a hard thing to convey properly in art without coming across as “glorifying” or “making light of” evil. I understand most people will probably have some reservations about getting excited about a song that, at the end of the day, is a happy song about a teenager fantasizing about killing people. It’s hard to get around that. Won’t most young people miss the nuanced message? In answer to your first question, yes, I think most young people will miss the message of the song. But that is not too surprising. The simplistic nature of the song’s arrangement, along with the repeated themes will render most people, not just young people, incapable of even hearing the lyrics. The song’s form makes it almost hypnotic, like much of the music in this genre, it functions almost as a lullaby that lulls our brains to sleep because there is nothing challenging in the composition of the song that would shock us out of the slumber that the song puts us in. 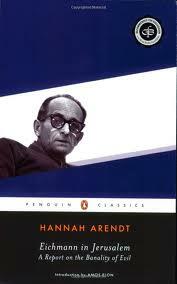 Secondly, I am not sure if the song really is about the banality of evil, in the way Arendt understood it. I see it as a reflection of the overly ironic hipster culture that is incapable or unwilling to see meaning in anything, which means that irony, or maybe lower sarcasm is the only theme this postmodern art is capable of. In fact, I see the sing-songy simplistic composition as a comment not so much on the banality of evil, but as a comment on whether there is such a thing as evil. The juxtaposition between the happy, melodic composition and the horrific subject of the lyrics has a function. This juxtaposition in my mind makes a comment on the absurdity of seeing anything as either good or evil. I don’t know that that is what the artists intended, but that is what I get from the song. Sorry for the length of my comment.